Steam is an online portal where you can buy games, share screenshots, artwork, and custom game assets, play games with friends, and even share games. These features are all available to anyone who signs up and buys a game on the service, but if you want to get in on the co-op action or game sharing, you first need to find and add your friends on Steam. Adding a friend on Steam isn't a difficult process, but there are a few problems that you can run into along the way. If you have a limited account, you will be unable to send friend requests, and if you don't know your friend's exact Steam profile name, and you can't find their account on the service, you will have difficulty adding them. There are three ways to add a friend on Steam: find your friend through the search function on the desktop app, website, or mobile app, find your friend through Facebook, or send your friend an invite link. The first two options allow you to send a friend request that your friend will see the next time they log into Steam, and the third option requires you to send a link to your friend through email, text message, or whatever chat app you use to keep in touch. You can't send friend requests on Steam until you have bought a game or added funds to your Steam Wallet. New accounts are locked into a limited state until they have spent a small amount of money. If you want to add friends before buying anything, ask your friends to send you invite links. The Steam desktop app is virtually identical to the Steam website, so you can add friends using whichever one you prefer. The store tab in the app corresponds to Steampowered.com, which is Steam's online store, and the community tab corresponds to Steamcommunity.com, which is Steam's online community portal. Open the Steam desktop app or navigate to Steamcommunity.com. Place your mouse cursor over your username in the menu bar. Type your friend's name into the search field. Locate your friend in the search results, and click ADD AS FRIEND. Note: Your friend will need to accept the request before they appear in your friends list. 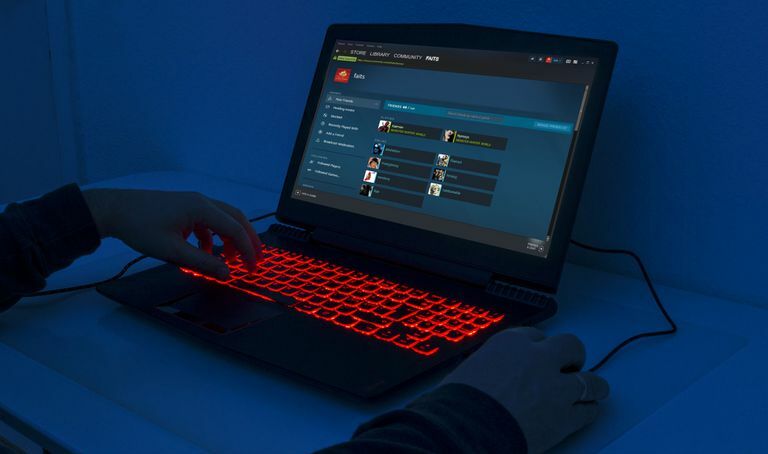 Steam users can change their profile names at any time. If you don't see your friend in the search results, make sure they haven't changed their name recently. The Steam app, which is available for Android and iOS, offers most of the same functionality as the desktop app. Some things are in slightly different places, but you can still accomplish most of the same tasks, which includes adding friends. Note: If the app opens on a screen other than your profile, first tap the ☰ (three vertical lines) icon > You & Friends > Profile. If you go directly to your friends list on this step, you will not see the option to add friends. Scroll down to the SEARCH FOR FRIENDS section. Locate your friend in the search results. Note: Your friend will not appear on your friends list until they accept the request. Steam features Facebook integration, which allows you to find and add your Facebook friends on Steam. If you're having trouble finding a friend on Steam, or you have a bunch of people you want to add at once, this feature can help you find and add them. Click Sign in to Facebook. If prompted, enter your two-factor authentication login code and click Continue. Look for the FRIENDS ON FACEBOOK section. If you have any Facebook friends who you aren't already friends with on Steam, they will appear here. Finding and adding friends on Steam is usually an easy and painless process, but it doesn't always work as expected. There are a few idiosyncrasies about Steam and the way it treats usernames that can make it tough to find friends, and if the database goes down, it can become impossible to find who you're looking for. When that happens, you just have to wait for Valve to fix the problem. When you sign up for Steam, you create a username that you use to log into the service. This primary username isn't the same as the username that people see in games or when you post in Steam community groups. You can actually change your profile name any time you want, which can create confusion when someone tries to add you as a friend. If you want to make it easier for people to find you, then you can also set a custom universal resource locator (URL) name that's the same as your account name. Steam Account Name - This is the username that you use to log into your Steam account. It can't be changed. Steam Profile Name - This is the name that is displayed on friends lists, in games, and in the Steam community. It can be changed any time you like. Real Name - This is supposed to be your real name, and using your real name can help your friends actually find you in search. You can put anything you want though, and you can change it at any time. Custom URL name - This is a name you set on your profile. If you set it to the same thing as your profile name, people can easily navigate to Steamcommunity.com/id/(yourprofilename) to find you. When you search for someone on Steam, you can use their Steam profile name or their real name, but you won't find them if they have changed their Steam profile name or real name to something else. Steam does keep a partial record of past profile names, and even provides an abbreviated list in search results, but you need to search for your friend's current name if you want to be sure to actually find them. Make sure that you're typing their current Steam profile name. If their current profile name is different from their Steam account name, try searching for their account name. This is more likely to work if their account name and custom URL name are the same thing. If your friend uses their real name, or a made up name, for their profile, and you know it, then you can search for that as well. If you still can't find your friend on Steam, make sure they have set up their Steam profile. Generate and send a Steam friend invite link if you are still unable to find or add them. If your friend is new to Steam, or they just haven't set up their profile yet, then you may not be able to find them using the search function. Ask them to open the Steam client, or visit Steamcommunity.com, and set up their profile. It can take a while for new Steam members to show up in searches as well, so you may just have to wait until the database updates. If you don't want to wait, then there are a few other ways to add a friend on Steam. The easiest way to add a friend on steam, other than finding them with the search function, is to generate an invite link and then give it to them. This process requires a little communication between you and your friend outside Steam, since you will need to send them the code via email or a chat app like Discord. Click CREATE AN INVITE LINK. Select the link and copy it, or click copy to clip. When your friend clicks on the link, it will open the Steam website, and they will need to log in if they aren't already logged in. Once they are logged in, they will see a banner message near the top of the page. If they click Add as Friend in the message, Steam will add you to each others friends lists.